I thought I'd start out 2007 with a retro visit to Meadowood Mall in Reno Nevada. The pictures are a scan of the directory I picked up in 1989. Being a Taubman mall, you can spot many of the hallmarks, such as lights in the skylights and unique art. On one side, you can make out Miller's Outpost and on the other, Miller Stockman. 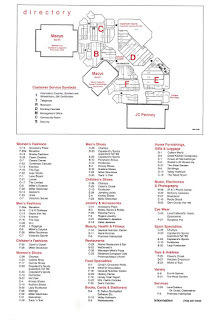 The directory is before Sears joined the mall, which included the addition of a food court. Rare indeed for Taubman. A unique service offered by the mall in 1989 is language assistance in Icelandic. Not many malls go to such lengths to welcome visitors from Iceland (or perhaps, Manitoba?). Meadowood Mall opened in 1978 with Macy's, Liberty House, and JC Penney. Liberty House closed in 1983 and Macy's South moved in the following year. Sears eventually left the soon to be demolished Park Lane Mall for Meadowood in the Nineties and the rest is history. The Summit Sierra shopping center is currently competing with Meadowood for top-spot. The Summit Sierra has only one department store (Dillard's) and is an open-air power center. Walking from store to store isn't an option and you must drive. However, being new, The Summit Sierra is currently very popular. Nevertheless, it's the test of time that will eventually tell. Enclosed mall vs. power center. Who do you think will win? Your review says that there's a lot of stairs at Meadowood. Does it have many levels to it?? Even though the Taubman style is very similar amongst their malls, I love the subtle variations they employed. I see that Meadowood uses 45deg angles and divided octagonal tiles that compliment the similar shape of the light fixtures above. Unfortunately, remodels to these malls are not as sophisticated in their design. Dean, good question. I was thinking about that statement last night. The mall is built on a sloping lot. The mall compensated by having one part of the mall higher (or lower) than the other. They placed the stairs in an Eastridge kind of way. Two or three here, then flat, then two or three more later. Most of them are grouped around the center court, where you can really see the difference in elevation. I think a sloping floor would have done the trick instead. But, considering at one time they intended to add a second floor to this mall, it would then would have been really similar to the elevation changes at Eastridge (or Woodfield, for that matter). I think you are right about the 45 degree angles. Even the logo has it! Maybe some Reno-ites can chime in. There may be no better illustration of the condition of today's shopping malls than Summit Sierra. Granted, I don't know the Reno market, but considering the tenants Sierra got, you'd at least have expected an outdoor format like Santana Row or Victoria Gardens in Southern Calif. But the fact that it's not indoor truly tells the tale. Perhaps if Sierra had gotten a Macys or Nordstrom to come on board it would have been different. Problem is, there just aren't that many big anchors left. And aside from Dillards, their other anchors are quite comfortable with the strip/big box format. And as long as it was upscale, the smaller retaiers didn't care. Had it been anchored by a Wal Mart, I doubt stores like Abercrombie would have gone near it. Years from now you could concievably put more buildings in front and convert it to a traditional outdoor mall, but I don't see it ever going indoor. As for Meadowood, I'm surprised Weinstocks never went there and had Reno been a bigger market, we might have seen it happen. But with Sears as a co-anchor, Park Lane probably did quite well for Weinstocks until the end. Hello, Reno resident here. My earliest memory of Meadowood is learning to skate at the indoor ice arena (long gone) and I was searching for some references to it when I found this page. 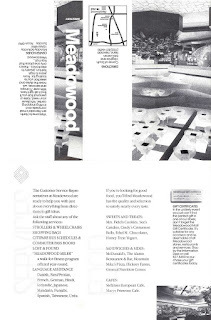 I very distinctly remember Meadowood without Sears (that was Park Lane Mall) and without a food court. The mall is not multi-story. The elevation varies inside with short ramps and flights of stairs typically three or four steps in total. As someone else said, it was built on a sloping lot. As far as its appearance, the original outdoor signs are still on at least one street entrance (the font is very 80's) and the inside still looks the same as it does in the scans you see on this page. The only obvious exception if you were to visit today is that the sculpture in the planter pictured on the front of the directory flier was converted into a fountain. Ultimately it was moved to a location near the information desk because its original planter/fountain location was demolished and replaced with a Starbucks a few years back. I was rather disappointed with that decision, but at least they didn't trash the sculpture. The "stage" area was flattened out with risers to eliminate the pit area (kids falling off it perhaps? ), but it wasn't filled in and it's still under there. Other than the Starbucks, all of the planters are still in place, the light fixtures are the same, and the floor still has the same tile. Today Meadowood owned by Simon Malls. Meadowood is the only mall of its type left in the city. Park Lane mall was demolished. Sparks has the more promising Legends compared to Reno's Summit, in my opinion. The Legends incorporates a lot of Nevada history and sculptures into its walking areas, and it's basically laid out like Meadowood except without a roof. Legends is also bringing the area's first and only IMAX theater, and it's a much shorter drive than Summit. I remember visiting Meadowood Mall in 1979 just after it opened (I still have an origianl mall directory) showing and listing the many retailers that no longer exist. Such as Liberty House. and the long gone indoor Ice Arena. When we visited in 1979 Meadowood had opened that very day and was still half empty with only Macys and Liberty House open, JC Penney had not opened yet. It was one of my high lights besides skiing since I bought a great portable stereo for $60 at Macys. Changing my Canadian Travel Cheques to US cash and impressing the Macys credit clerk with my very stylish Alberta Drivers Licence...HA HA. Thanks for this page. I recently took a job at Meadowood, so it's kind of cool to go back and see the way things used to be. The mall has begun a massive renovation that will bring in new, upscale tenants and involve several store relocations. I'm working on updating the Mall's Wikipedia page as info becomes available. Does anyone have pictures of Macy's restaurant that was upstairs in the North building? I've been searching for any images of it. And have yet to find one. Does anyone remember, and have any pictures, menus, or memories, of the restaurant JB's Arbor house at Meadowood Mall? It was in business between 1983 and 1985, later becoming the Alamo Mexican restaurant. I was a regular there, was friends of many other regulars and the owners themselves, Bob and Joyce Boysol. I lost track of all of them but still have the nostalgic memories. According to the Macy's, Inc. Corporate Fact Book on their store directory, they say the Macy's Reno Men's Store opened in 1979 (as Liberty House), and the main Macy's the year before. Do you have the exact opening dates for the mall and each of the anchor stores, including when Macy's took over Liberty House? I visited there in late August 1984 as we were moving to Boise, and the Macy's Men's Store was preparing to open soon.